Between 1982 and 2006, there were 89 distinct publications dealing with oral appliance therapy involving a total of 3,027 patients, which reported results of sleep studies performed with and without the appliance. These studies, which constitute a very heterogeneous group in terms of methodology and patient population, are reviewed and the results summarized. The majority of patients prefer using oral appliance than CPAP. Use of oral appliances improves daytime function somewhat; the Epworth sleepiness score (ESS) dropped from 11.2 to 7.8 in 854 patients. A summary of the follow-up compliance data shows that at 30 months, 56-68% of patients continue to use oral appliance. Side effects are relatively minor but frequent. The most common ones are excessive salivation and teeth discomfort. Efficacy and side effects depend on the type of appliance, degree of protrusion, vertical opening, and other settings. We conclude that oral appliances, although not as effective as CPAP in reducing sleep apnea, snoring, and improving daytime function, have a definite role in the treatment of snoring and sleep apnea. 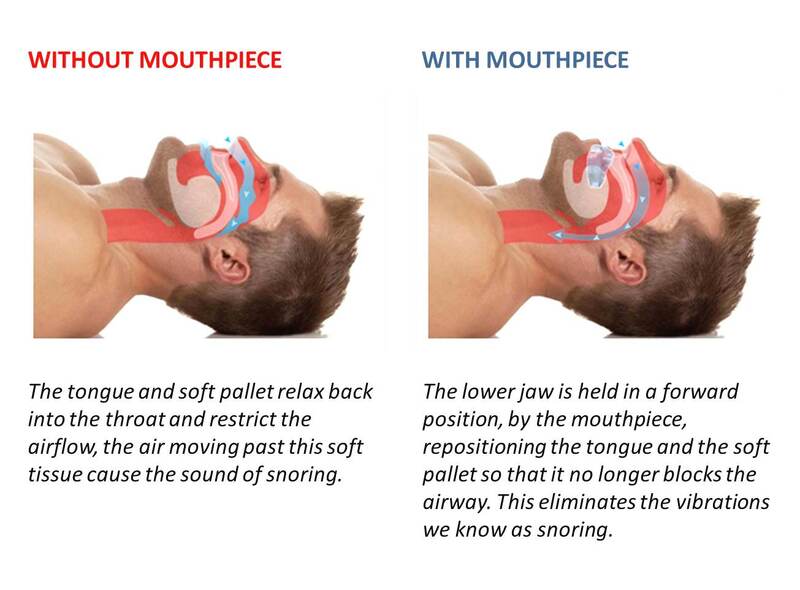 ORAL APPLIANCES FOR THE TREATMENT OF SNORING AND OBSTRUCTIVE SLEEP APNEA: A REVIEW. Department of Medicine, University of New Mexico, Albuquerque 87131, USA. The 21 publications selected for this review describe 320 patients treated with oral appliances for snoring and obstructive sleep apnea. The appliances modify the upper airway by changing the posture of the mandible and tongue. Despite considerable variation in the design of these appliances, the clinical effects are remarkably consistent. Snoring is improved and often eliminated in almost all patients who use oral appliances. Obstructive sleep apnea improves in the majority of patients; the mean apnea-hypopnea index (AHI) in this group of patients was reduced from 47 to 19. Approximately half of treated patients achieved an AHI of >10; however, as many as 40% of those treated were left with significantly elevated AHIs. Improvement in sleep quality and sleepiness reflects the effect on breathing. Limited follow-up data indicate that oral discomfort is a common but tolerable side effect, that dental and mandibular complications appear to be uncommon and that long-term compliance varies from 50% to 100% of patients. Comparison of the risk and benefit of oral appliance therapy with the other available treatments suggests that oral appliances present a useful alternative to continuous positive airway pressure (CPAP), especially for patients with simple snoring and patients with obstructive sleep apnea who cannot tolerate CPAP therapy. Am J Respir Crit Care Med. 2001 Sep 1;164(5):813-8. The American Academy of Dental Sleep Medicine has recently identified oral appliances as an effective treatment for OSA. A 2001 study in Switzerland found oral appliances effective in treating sleep apnea. ✓ While 76 per cent said they were snoring on fewer nights per week.